Growing up on the water and being raised in the family marina business lends itself to a love of everything and anything marine related. It only seemed natural to design a "Life at Sea" month long unit study. This is just week one of four. The kiddo really enjoyed this unit. Who doesn't love learning more about boats, echinoderms, stars, and more? I decided that we would first tackle our long vowel sound phonograms. Honestly, I don't even know if I'm saying this right, but from what I've read and studied I think I am. This week we're focusing on the long A sound. Next week, I'll move onto long E and so forth. Once we've tackled the long vowel sounds, I'll move on to other phonograms. In the activity above, Dinomite is to sort out the words provided by phonogram. To ensure that Bulldozer and Princess could still participate in this activity at their level, I made sure to use rhyming words. They may not be able to understand phonograms, but they can match up words that rhyme based on their endings. To go along with our sorting activity, I created a writing activity based on those I've seen used in the Montessori world. There are five sets of words, each one for a different long vowel sound. Again, we're only working on long A words this week, but I decided to make the entire printable available to everyone now. Source: I created this printable. For your free copy of all long vowel sound cards, click HERE. And lastly, to really drive the whole idea home and help Dinomite apply his knowledge, I created picture cards to use with our movable alphabet. The cards are all related to our theme of the month. Source: I created these cards, using my format for nomenclature cards. Last time this activity was on the shelf with another option, all of the kiddos chose the other option. One of Bulldozer's and Princess' goals for the month is to learn their coin values. I thought this would be perfect. The control cards have the money values on the back. They really seemed to help the kiddos today as they worked. Source: I found this free activity at Counting Coconuts. Dinomite has worked on this activity in the past, however this time Bulldozer and Princess are also learning the concepts. So far it's going great. If Princess can just remember the word "thousand" she'll be all set. Source: I found these free cards at Montessori Print Shop. We've done this activity before, but I wanted to pull it out again because we've just learned our counting by 2's song. Sure enough Bulldozer and Princess were both able to complete the activity with minimal help. Most of the help had to do with writing their numbers, as they're still learning this. Source: This printable is part of a larger set available for free at 3 Dinosaurs. We've done this activity before also, but it seems we can never practice our addition skills enough. The kiddos role the dice, place the stars on the night sky, and then write the math problem to the side. Dinomite completes 6 problems because he's 6 years old, Bulldozer-5, and Princess-4. I've found the age thing to be quite a great tool when it comes to tasks that may seem daunting to them. We've done this activity as well, however the kiddos really struggled with the concepts of stars and constellations. This time they seem to be getting it much more. Source: I found these free cards at Montessori For Everyone. This activity is really simple. I just printed out a map of our sky and where all of the constellations would be during a specific time of year. I then cut it up into four pieces and have the kids put it together, using the directions on the sides for help if needed. It's a very popular activity on our shelves. I saw this activity just last week on a link up I participate in. Immediately I fell in love with the idea and just had to use it. The kids LOVE it! I was a little worried that the larger constellations would give them problems, but they didn't! Just look at their work! Source: The idea for this activity came from Natural Beach Living. The free cards I used are available HERE. I did not create them. There's nothing like using all our senses to examine real life echinoderms, even those that are dried out and not alive. I've been very impressed with how careful the kiddos have been. We can't have a unit about Life at Sea without studying boats. Over and over again, I am so thankful that I decided to introduce my kiddos to Safari Toobs long ago. We have such a collection. I rarely ever have to buy any. They've worked great in stockings at Christmas, and fit perfectly in large plastic eggs at Easter. (We don't ever use candy at Christmas or Easter because of Bulldozer's allergies.) The boats came from Bulldozer's collection. I do believe one of his boats was missing, but other than that I have created cards that match up with each boat in the packet. Bulldozer broke his sailboat, so I created another card in the set to match Dinomite's mini pirate ship, which is also a sailboat. Both types of sailboats are included in the printable. Bulldozer is loving this activity! If I had only known how entertaining a bin of water, one plastic floating boat, and a straw would be to my kiddos, I think I would have made this available years before. This month the kiddos will be introduced to directions and compasses. Before I went into the technical stuff, I wanted to give them hands on experience to help them understand what direction actually is and why it's so important at sea. I told the kiddos they needed to move the boat from one corner of the bin to another using the straw. The only rule I gave them was that the straw could not touch the boat. The kiddos first attempted to blow the boat. Immediately they were able to make the boat go one way, but all of them ended up blowing the boat into the opposite corner of where it needed to go. The boys were quick to realize they needed to change the placement of the straw to make the boat move. However Princess really struggled. She tried everything but moving the straw to where it needed to go. Finally, observing her extreme frustration I showed her what to do. Eventually she was able to move the boat out of the corner. Bulldozer became bored blowing the boat where it needed to go. He decided he was going to put the straw in the water and tilt it so it was under the boat. He'd blow as hard as he could, making bubbles, that would eventually move the boat where it needed to go, almost like an engine. Of course once it was discovered that the kiddos could blow bubbles to make the boat move, they had loads of fun causing the boat to tip over etc. I pulled out our map of continents for a review, but also so Bulldozer could work on it. He's starting to really enjoy puzzles, but really struggles with more than 10-12 pieces. This one is pretty easy, so he felt great when he completed it. Art: To be completely honest, I haven't planned out an art activity this week. I had a great plan and then I ran out of time. My guess is next week we'll hit the subject hard. Music: We've started a new piano piece this month. I figured I'd give it one more try. This time I selected a much easier piece. Dinomite was very excited about it and played the first part with confidence today. We'll also be learning some new songs that will come next week. Physical Education: Extra-curricular activities have started back up this week. Dinomite takes a 90 minute gymnastics class and is on a bowling league. Bulldozer takes 30 minute tennis lessons, 30 minutes swim lessons and is on a bowling league. Princess is in dance class and gymnastics. No need to worry about P.E. minutes anymore! We're learning about boat safety this month. Life jackets are at the top of the list. Seeing as they kiddos all have one, I figured we've have them learn how to put it on and take it off by themselves, including the buckles. They're doing quite well, except for Bulldozer who won't touch it. Go figure. The lacing cards are back, and will be a lot this month. They are still disliked but do get use. Princess was getting very frustrated today. I decided it was time to teach her how to unlace, so she could fix her mistakes. I applaud her for her attempts. Once again the sun block is on the shelves along with the sunglasses. Dinomite and Princess have practiced each day this week. We have these cute little foam ocean animals that float in water. I thought it would be fun to try to catch some. To make it more colorful I added blue glass beads to the bottom, along with some plastic starfish. It's hard to see in the picture, but I purchased the smallest fish net the pet store had. The kiddos practice scooping out the yellow foam starfish, without picking up stones etc. Some of the fun has definitely been had trying to figure out how to get the stars out of the net once they're caught. 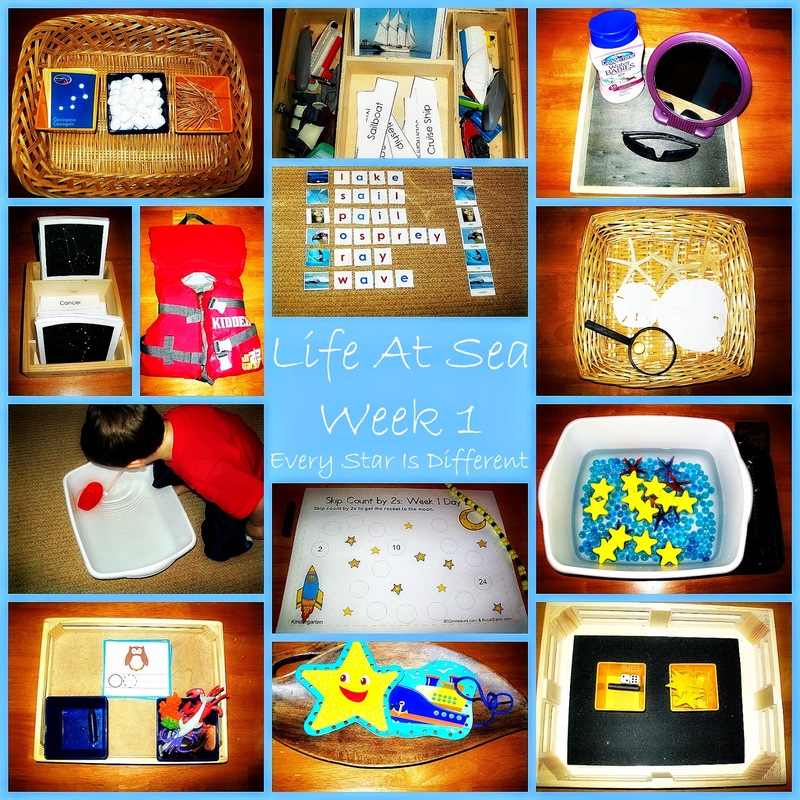 Next week we'll continue our Life At Sea unit, so be sure to check back for more fun activities and printables! Lots of great activities! Love that money match activity. Thanks for sharing! What a great unit. Looks lots of fun and so many great learning opportunities. Looks like lots of great activities for them to learn from.